Of course, as long-time readers of this blog know, it's not just the Beltline Advisory Board that I've been asked to join for the benefit of my neighbors. To help shore up support for the community's interests, I have also gotten involved in the local coalition of neighborhood groups and have become immersed in controversy there after a presentation that I was asked to give to them last month. 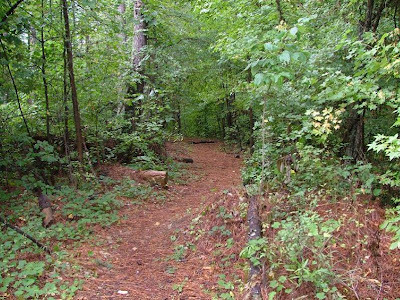 The neighbors are also very concerned about the effects of a proposed multi-use trail planned to be paved through Tanyard Creek Park, a former Civil War battlefield and the only remaining piece of undeveloped greenspace in our neighborhood. This latter issue is one of the most polarizing ones in which I'm involved. Everyone has a strong, passionate opinion about it, including myself, and no one seems to be "neutral." 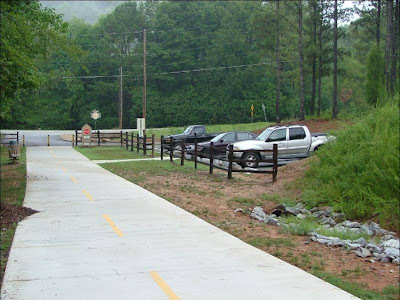 The trail proponents have tried to assure us that the planned trail is compatible with the greenspace nature of the park, and told us to just look at what they did in Atlanta's Mount Arabia Park for examples of the styles of trail they're planning for Tanyard Creek Park. This is a typical example of the lush, green forest that grows on the Georgia Piedmont, characterized by red clay soil over gently rolling topography. Not all of the flora are native species, but the ground cover provides a habitat to a great many species of fauna. "Pave paradise," to quote the song, "and put up a parking lot." Not much habitat apparent here. Now imagine the trail above running through Tanyard Creek Park, shown at the top of this post. Not exactly compatible, I think you'll agree. Okay, a little greener and at least we've got some shade, but the boardwalk (which, by the way, Tanyard Creek Park won't be getting, despite our requests; we're being offered nothing but concrete ) and it's side rails completely separate the user from nature. No feet on soft ground, but just a conveyance designed to get one through the park as quickly as possible, without veering off course and with as little communion with Mother Nature as possible. Of course, that's just my strong opinion, reinforced by ego-attachment. But I'm a moderate on this issue. Many neighbors are passionately opposed to it, and are suffering greatly at the thought of losing their beloved park. What would Dogen do? Counsel them of the impermanence of all things, including a Civil War battlefield, or work to their benefit to help protect the park? Like the Buddha before him, Dogen leaves it up to us to decide. “In each situation that you are faced with, just consider carefully; do anything which will bring even a little benefit to the person who is before you, without concern for what people will think of you." All the time and in whatever situation, we are advised to consider things only for the benefit of all living beings. Dogen says we should "speak after making careful consideration; act after giving attentive thought; do not act rashly." In other words, a little mediation wouldn't hurt. "Ponder over what is reasonable in whatever situation you encounter." I wish I lived in the city so I could help! 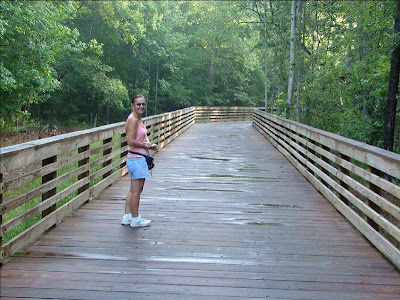 My mother lives in a condo and townhouse development in Florida which has done a much nicer job of integrating the boardwalks and trails with nature. For photos, see www.dolphincay.com. The boardwalks are much narrower and windier. It looks to me like what PATH is trying to accommodate are bicycles, which seem to be the bane of everyones' existence these days. Why do you need to drive to a trail where you are walking for exercise anyway?